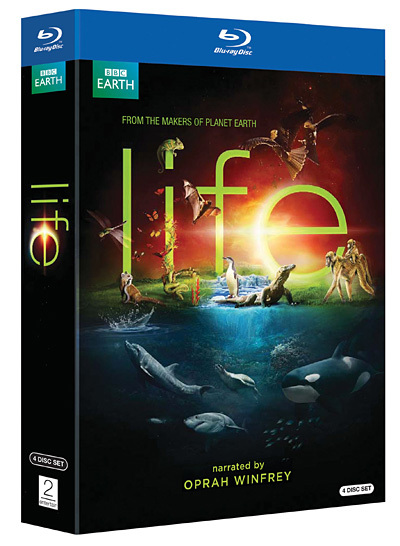 The much anticipated LIFE series from the BBC and Discovery Channel will release on hi-def Blu-ray and DVD June 1, 2010. The series documents in astonishing high-definition the natural world’s struggle for survival. Extreme camera techniques, such as high-speed photography at speeds of 1,000 frames-per-second, make this an extraordinary piece of documentary work that covers all continents. The US version of the 11-episode series is narrated by Oprah Winfrey, while the UK will get their own version with Planet Earth’s narrator Sir David Attenborough. The series will feature never-before-seen on television footage such as Komodo dragons hunting a buffalo ten times their size, and Capuchin monkeys using rocks to open palm nuts. The film also documents events such as the development of a coral reef on a sunken boat, all underwater using time-lapse photography. 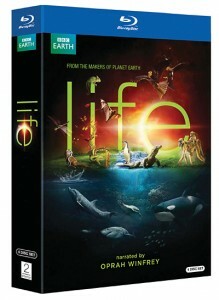 LIFE on Blu-ray will arrive June 1, 2010 with a suggested retail price of $69.99 (DVD $59.99). The four-disc set, with content entirely in high-definition, will contain all 11 episodes as well as The Making of Life. Extras include deleted scenes, a “music only” viewing option, and Life on Location, a collection of ten production video diaries. Here’s a link to a LIFE trailer on YouTube (embedding not permitted).